I don't cook on Fridays. I pride myself on preparing homemade meals all week. But not on Fridays. I don't cook on Fridays. Sometimes, we have leftovers. Other times, it's french fries, pre-made dumplings, or some easy frozen dinner. Most times, we go out. It's not usually a fancy dinner, but it must be a) kid-friendly, b) cost efficient, c) fast and d) tasty. Of course, healthy is always a bonus, although I do let that go every once and a while. Because we go out for dinner often, we like to try new cuisines, and consequently, our girls enjoy an entire variety of cultural dishes -- from sushi to Thai, Chinese and Mexican. We believe exposure to new experiences (and flavours) opens up a new world of curiosity and taste. It's possible. Kids can enjoy more than hot dogs and chicken fingers. I'm pleased to bring Simply Suppa readers this new feature: I Don't Cook on Fridays. I'll try and keep it as regular as possible, so you can get some great restaurant ideas for you and your families to enjoy. Sometimes, I'll feature local eateries, other times, a quick stop to grab a bite. 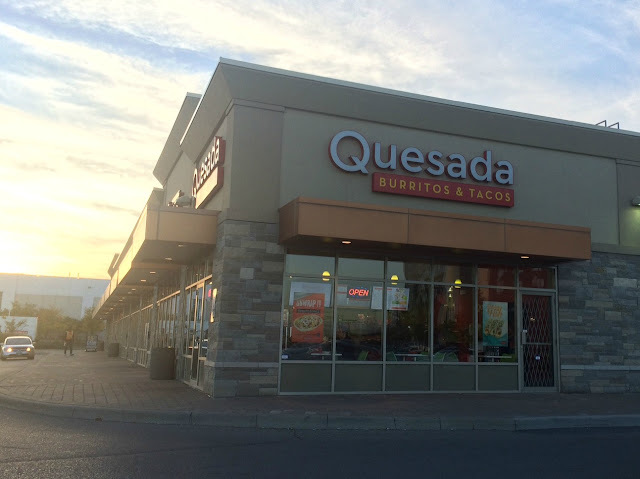 The first on my list: Quesada Burritos & Tacos. 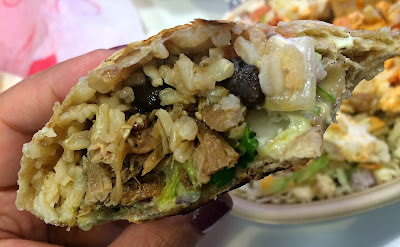 OK, so if you've never been to, or heard of Quesada, it's a Mexican dine-in, take-out burrito bar. You customize your order by selecting everything from your wraps, protein, beans, veg, sauces and more. If you're on a meal plan, or watching your diet, this is a friendly spot. There are many options for lean proteins and healthy choices without relegating yourself to a plain, simple, tasteless salad. Donny and I shared two dishes because we couldn't decide -- we went with a Flame Grilled Chicken Bowl (all the fun minus the shell) and a brand new menu item, the Pulled Pork Carnitas Burrito. I've made pulled pork before, but it never tasted like this. 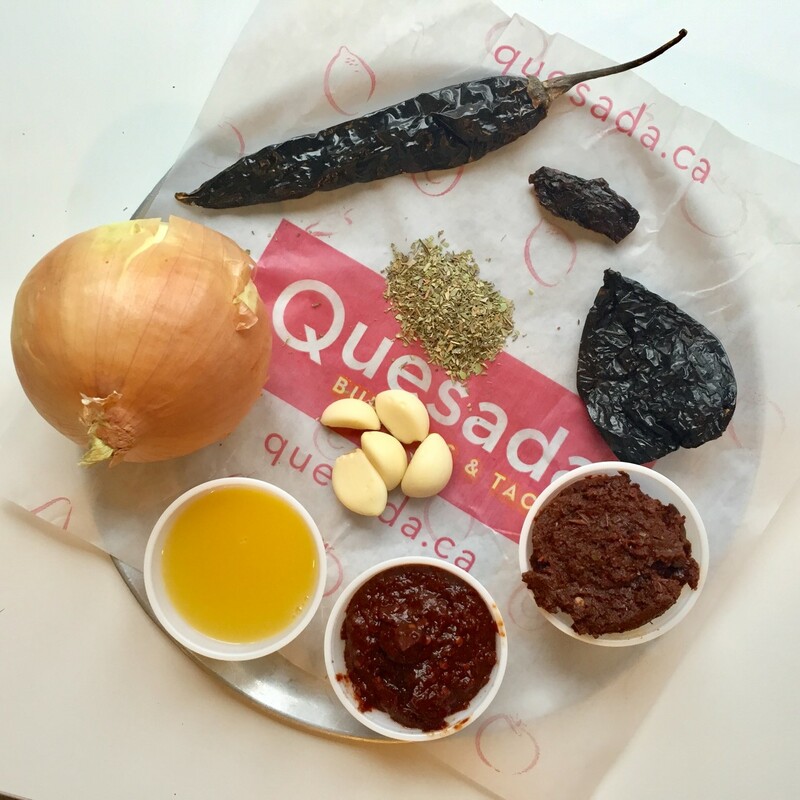 The Quesada pulled pork is loaded with flavour and spice -- wait for the recipe below -- but it's also mild for those who can't really handle the heat. If you want to jack up the fire, add one of the eatery's homemade sauces or salsas. All in all, I think Quesada could be a Friday favourite. Fast, healthy, affordable. A full meal for less than $30 and we're a happy family. Want to try it for yourself? 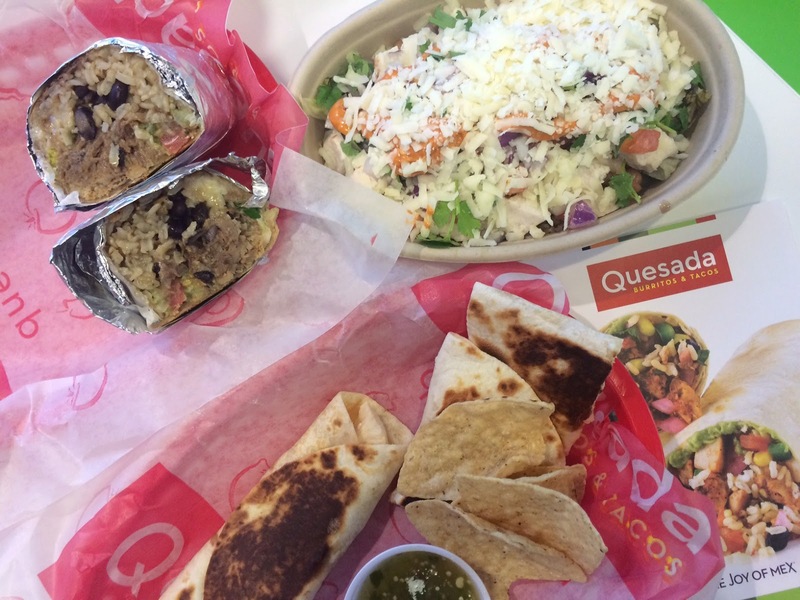 Enter below to win a $30 gift card to Quesada Burritos & Tacos. And if you DO want to cook on a Friday (or any night), Quesada Founder Steve Gill shares his DEEEELICIOUS pulled pork carnitas recipe with Simply Suppa! Maybe I'll try it one night next week. But not Friday. Mix together all ingredients, except for the pork shoulder, in a slow cooker. Add pork shoulder and ladle some of the spice mixture over pork to cover. Place lid on slow cooker, set on low and cook for 8 hours. Once cooked, remove pork onto a rimmed baking sheet and shred with 2 forks. Add some of the slow cooker liquid back into the shredded meat, if desired. Quickly sear your meat in a hot pan before putting it in a slow cooker. This will bring out more flavours in the meat. Use less expensive cuts of meat, like briskets, chicken thighs, pork shoulder in your slow cooker. These tougher cuts have a lot of flavour and become fall off the bone tender once cooked. Trim excess fat from larger cuts of meat before cooking. By trimming it first, you won’t have as much fat in the cooking liquid once the meat is done. Don’t add too much liquid to your slow cooker--juices will naturally come out of meats and veggies while they are cooking. And because slow cookers have tight lids, none of this liquid will evaporate. Use your slow cooker as a warmer on a buffet table. It’s a great way to keeping your slow cooker meals warm while serving a crowd. Don’t forget drinks! Use your slow cooker like a punch bowl, by keeping hot drinks hot when serving a crowd. Serve your favourite hot beverage (mulled apple cider, Mexican hot chocolate) right out of the pot! Avoid temptation and keep the lid on! Every time you remove the lid of your slow cooker, you release heat, which means your meal will take longer to cook. Just turn it on in the morning! Prepare your slow cooker ingredients the night before and put the prepared slow cooker pot in the fridge. In the morning, take the pot out of the fridge and leave it at room temperature for a bit (30 minutes to an hour), to take the cold edge off. Then just turn it on and let it do its work while you’re at work. Disclaimer: This is a sponsored post. As always, all opinions expressed on my blog are my own. we are always looking for places with options for picky eaters and of course, great value is awesome! Having the opportunity to grab something loaded with veg on the go is GREAT! I look for fresh, quality ingredients. I look for a restaurant that sells healthy and fresh food.